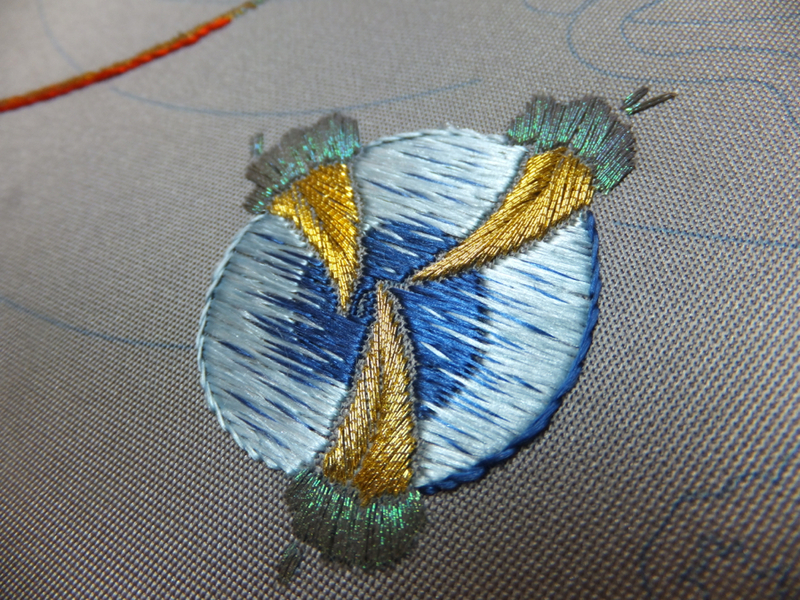 I’m hoping to find time to photograph my work and set up an artist homepage for it sometime soon. My portrait painting is really coming along too. I will be sure to let y’all know! 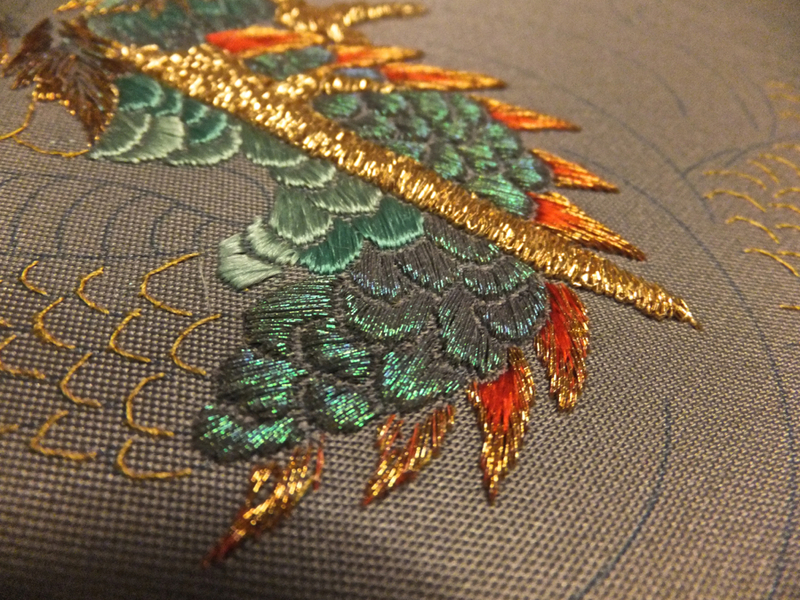 I finished the scales and spikes on the first segment! Plus I added some details, like the red around the snaggle tooth. 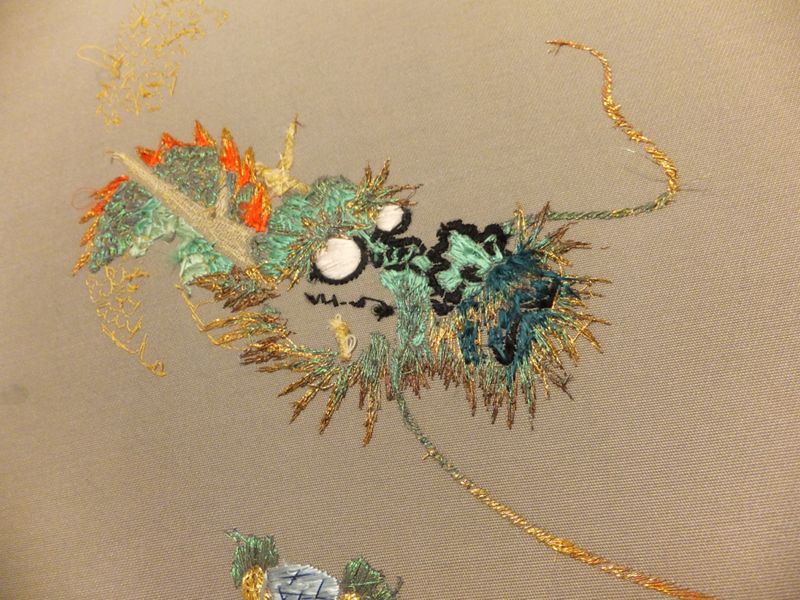 This dragon only has one tooth – he stabs you once and then gums you to death. There’s now an outline around the crystal ball. And some red to make the antennas pop. 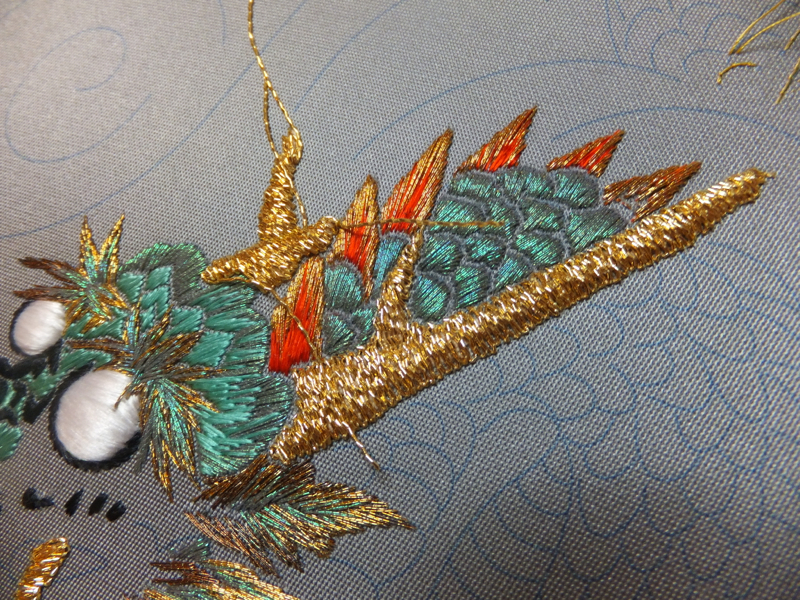 I am plugging away on the scales and spikes. 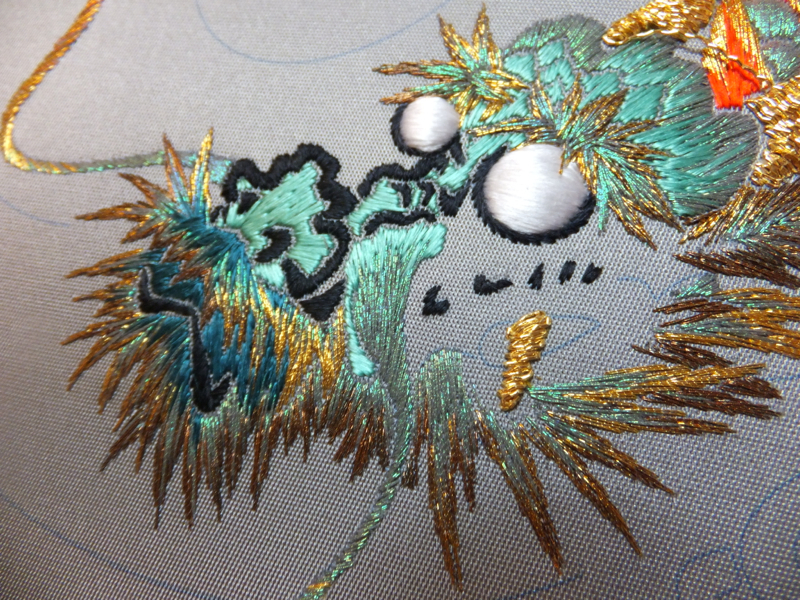 The play of the light between the various silk colors and the metallic threads is really flashy. 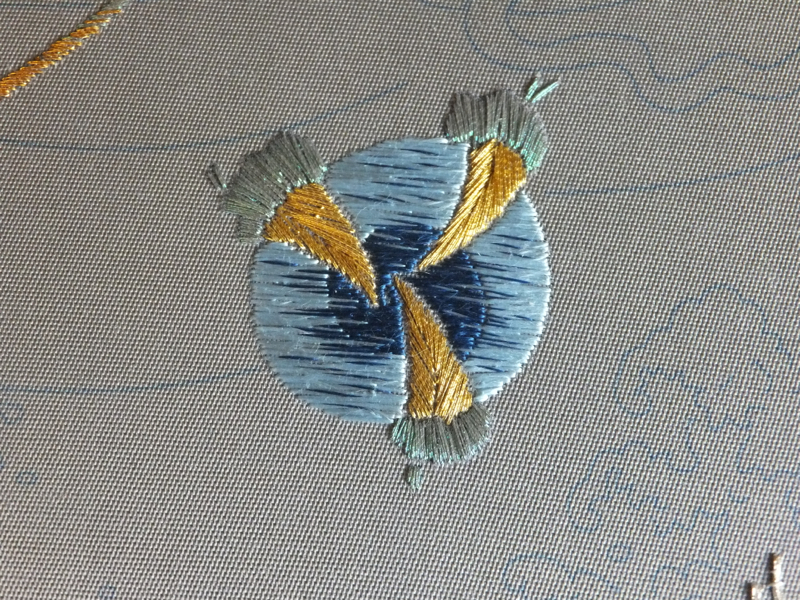 All the under stitching and padding gives the edges a raised effect, so the whole thing has a lot of texture. 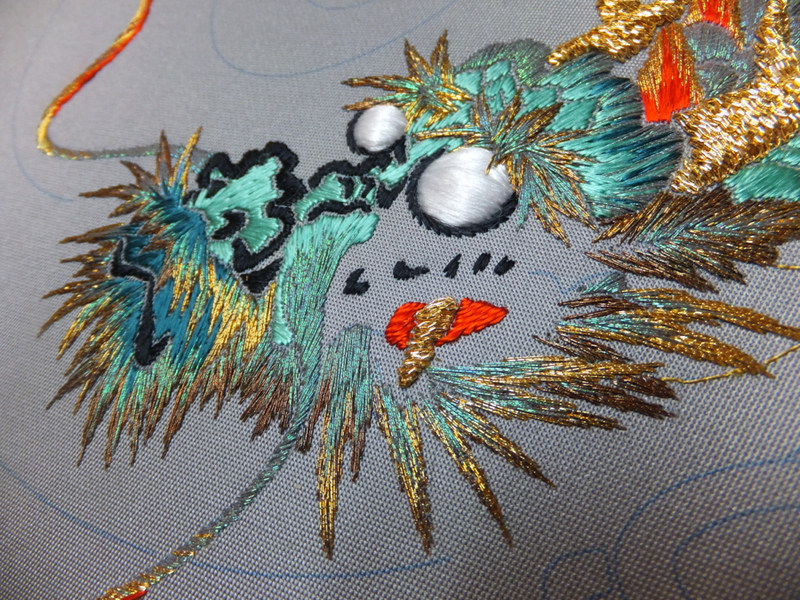 Today I’ll also show you the back of the piece! It’s staying fairly neat. Not much to say this week except that I am still working away on it. Onwards! 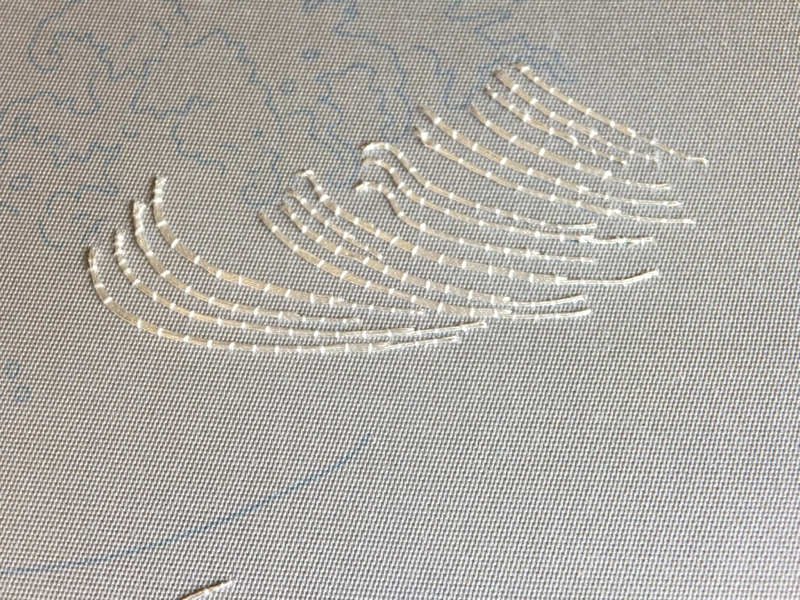 So in today’s post I update y’all on the progress of the waves! 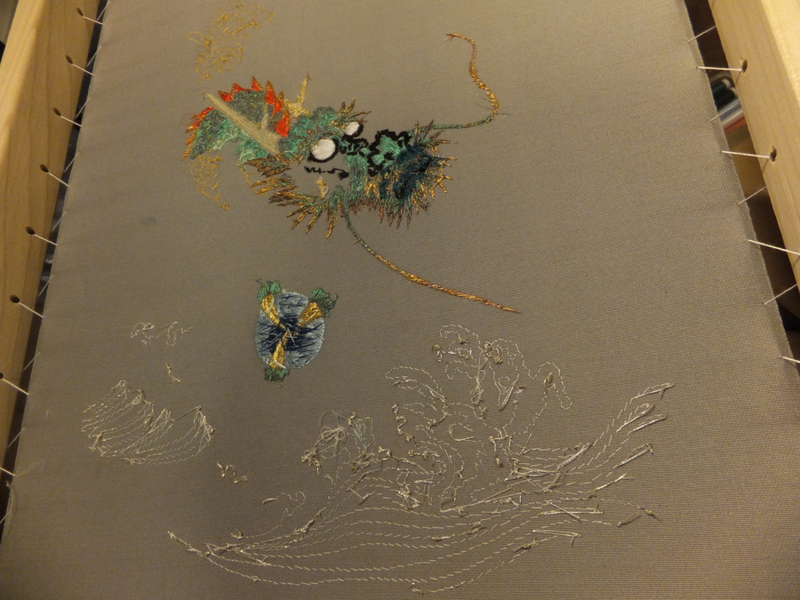 I am couching down lots of silver thread and will soon be overstitching splashes in various parts of the ocean. This work was inspired by the audiobook for Dorothy Sayer’s novel Unnatural Death – I really enjoy Lord Peter Wimsey’s detective skills. 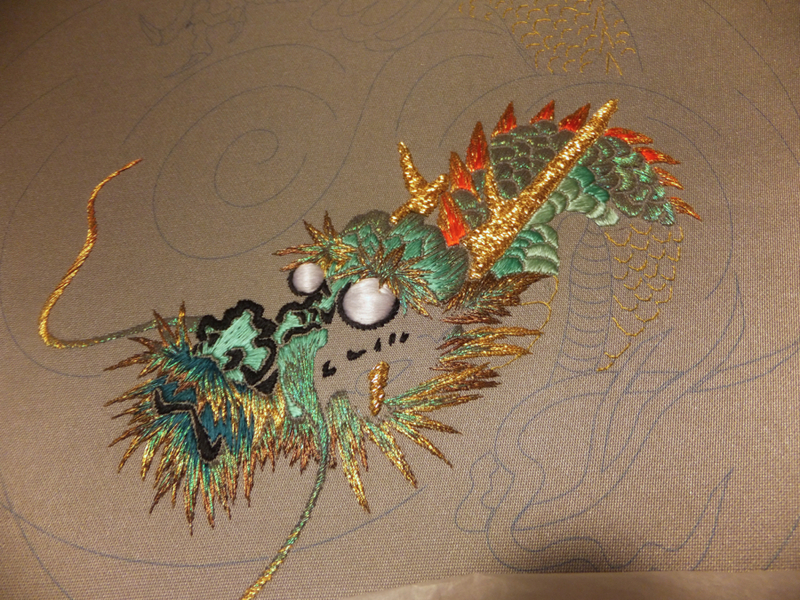 I think this dragon is going to require several more novels before I’m done. All these little curves take a lot of tiny work. The overall effect is going to be stunning though, see below! 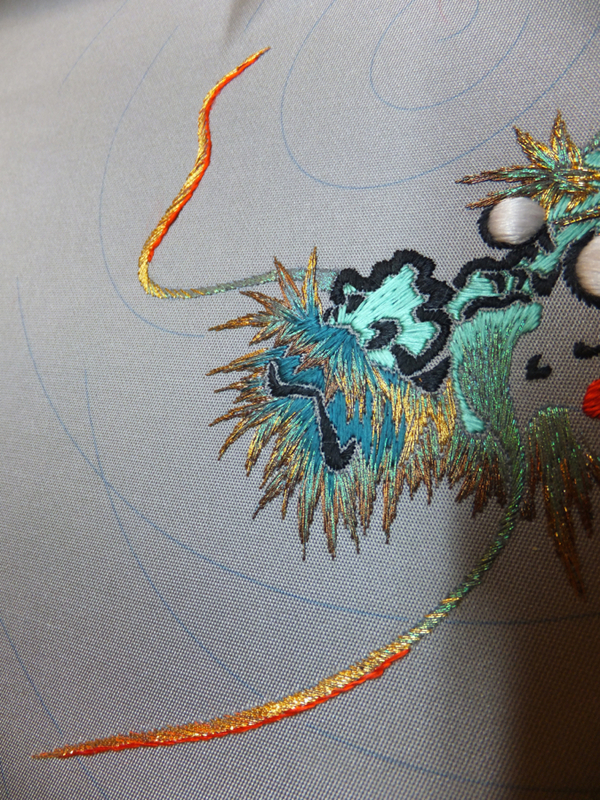 I couched more lines for the rest of the scales, too. I also twisted up some special threads for the flames. 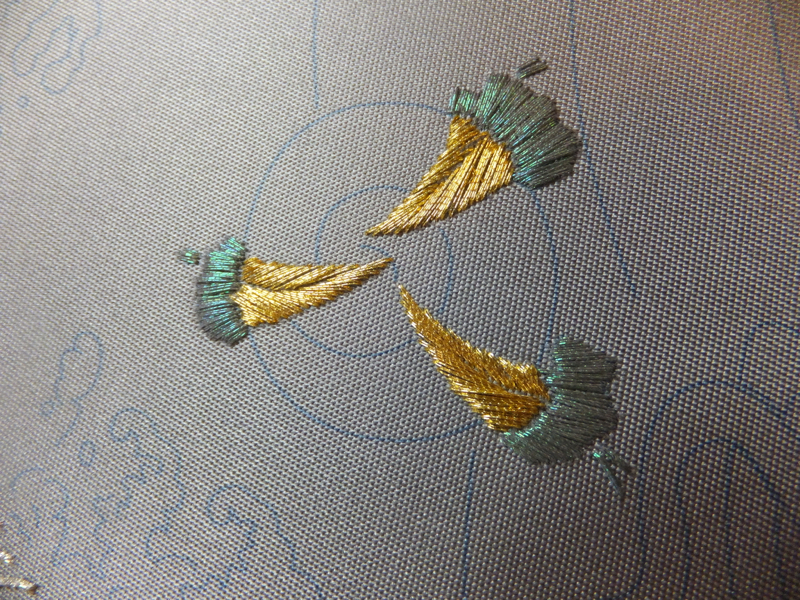 They’re 2 or 3 strands of twisted silk wrapped around a half strand of silk to get a very dimensional twisted effect. 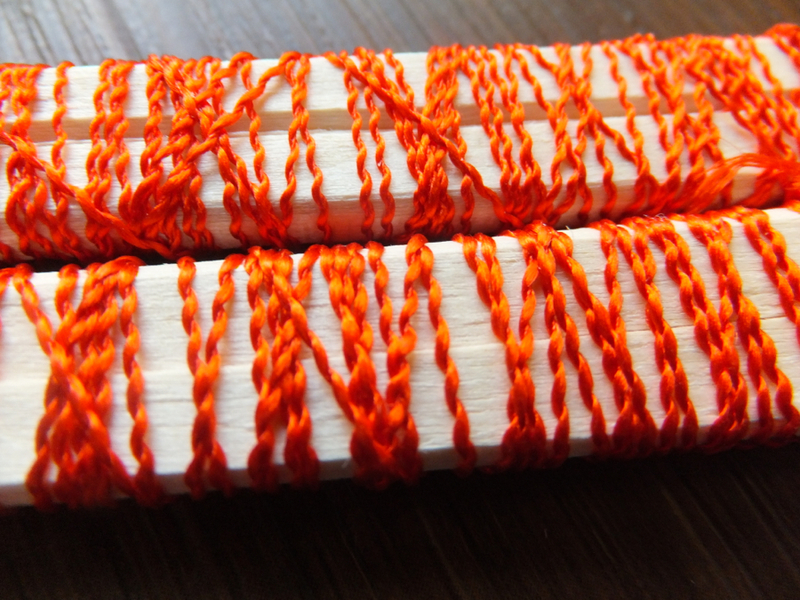 It’ll be in various shades of red-orange blended into each other. 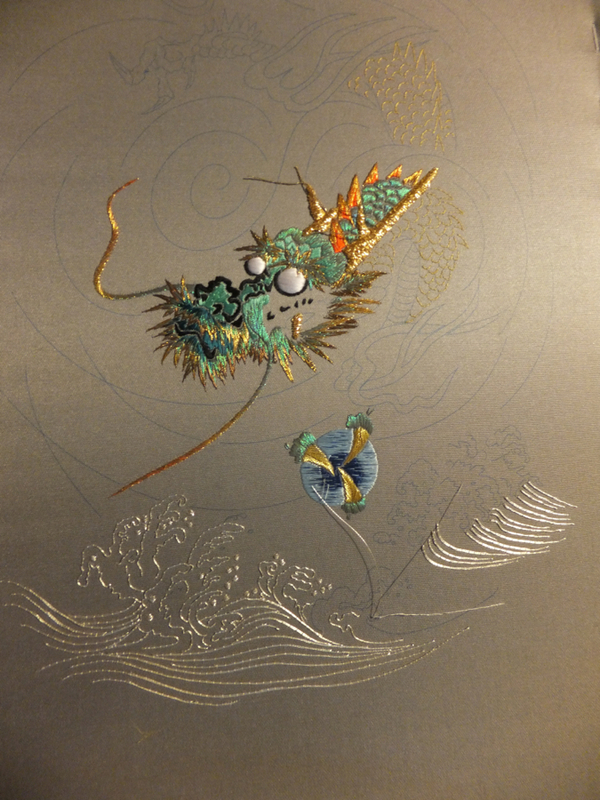 I added a second horn and a whole lot of scales and spikes. 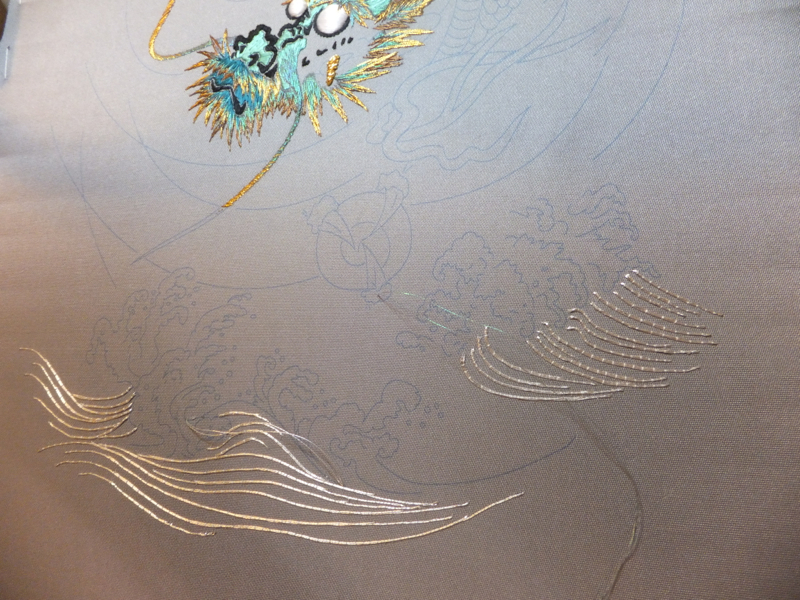 At the top right you can see that before stitching each scale or spike I have to outline first so the edges are padded and have a smooth curve. 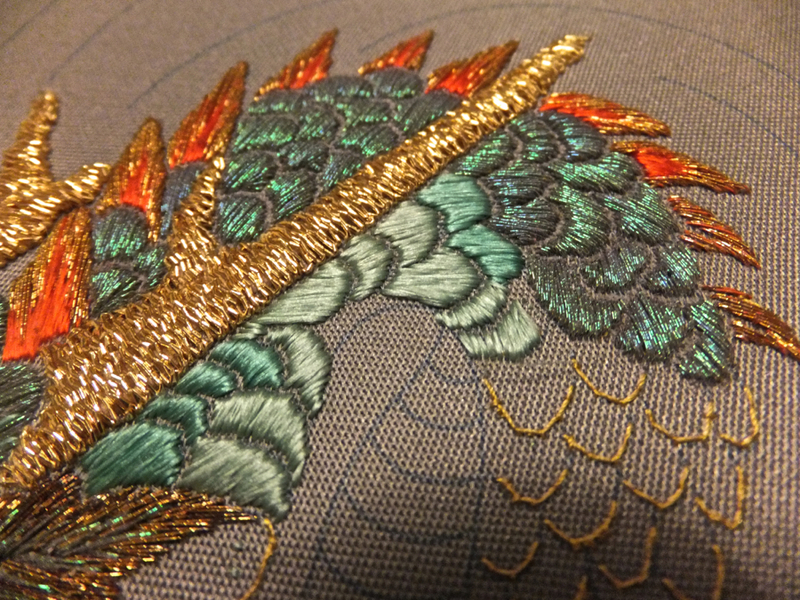 You can also see that I have an awful lot more scales to go. And here is your closeup for a better view! Includes bonus ear-whisker. 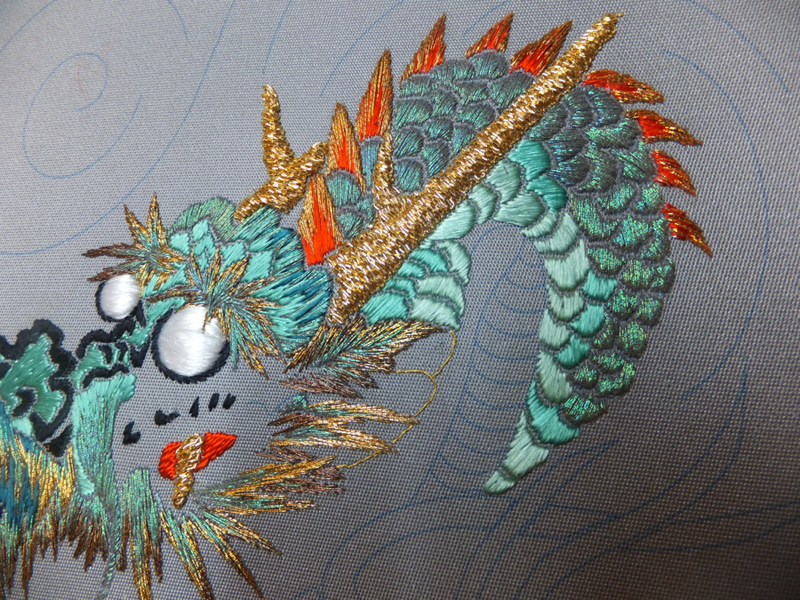 This dragon has a gold tooth now. But only one! He’ll gum you to death. 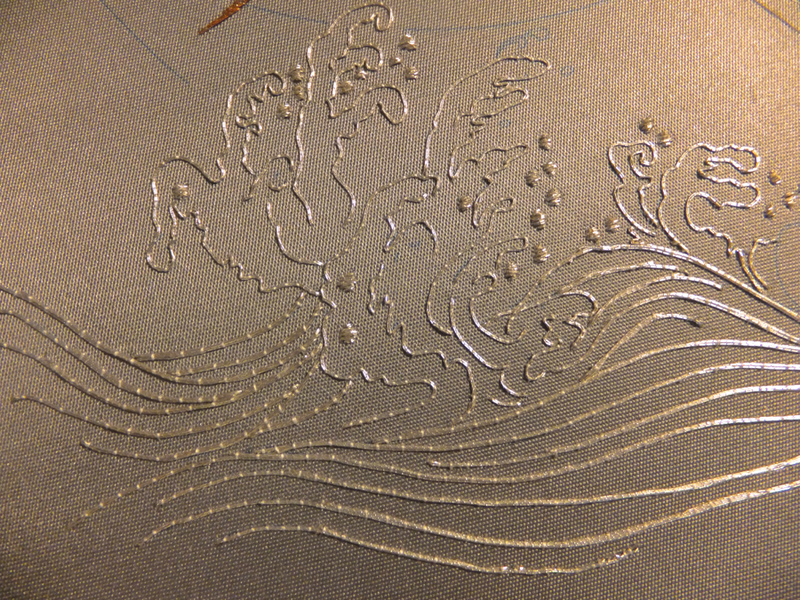 Then I worked away on the waves at the bottom. They’re all in silver. I’m about to reach the splashes at the top now. They all had to be carefully couched so they followed the swells and tapered off at the end. I knocked them out, though! 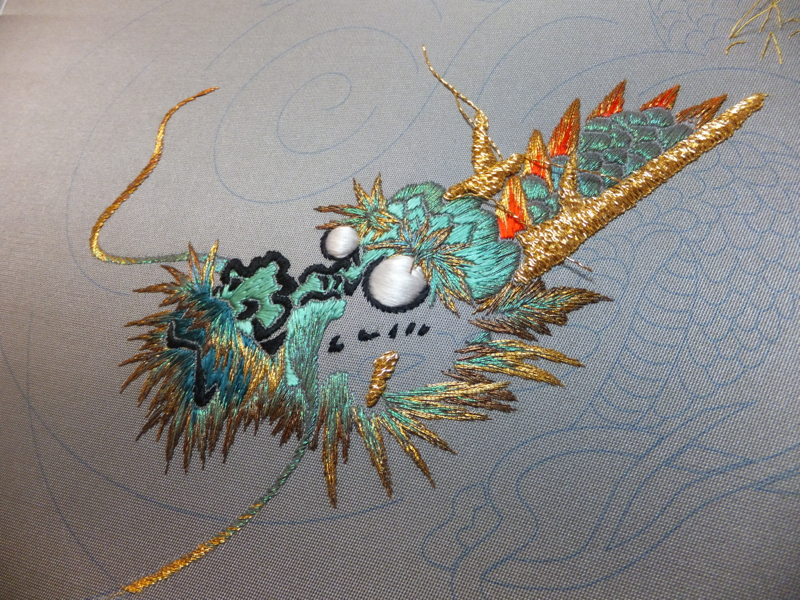 Next week: Exhausted from all the swimming, I go work on stitching millions of scales.